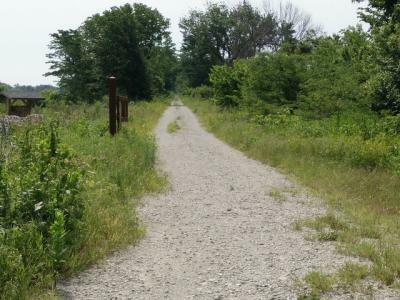 The deadline for State Parks to make a decision whether or not to accept the Rock Island corridor and transform it into a trail is early 2019. State Parks has been working through 2018 on a plan for doing so, and weighing the pluses and minuses. We anticipate that these meetings will inform the public about whether or not State Parks intends to accept the corridor, and accept public comment about that decision. At the time, we do not know whether or not State Parks is intending to accept the corridor or what their plan or conclusions look like. The meetings are located in fairly remote locations in Missouri along the Rock Island corridor. But this decision affects all Missourians, wherever you live. If at all possible, please plan to travel and attend one of these meetings in person, as those in-person contacts carry by far the most weight. JEFFERSON CITY, MO, OCT. 12, 2018 – Missouri State Parks will hold a series of three informational meetings in communities along the Rock Island Line Corridor. 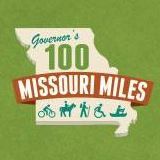 The purpose of the open house-style meetings will be to discuss the potential effects on communities, citizens and Missouri State Parks if the Corridor were to be developed into a long-distance recreational trail. Individuals requiring special services or accommodations to attend the meeting can make arrangements by calling 800-334-6946. For information about state parks and historic sites, visit mostateparks.com. Missouri State Parks is a division of the Missouri Department of Natural Resources. State Parks has not at the present time indicated any way for citizens to respond if they are not able to attend the meeting in person. 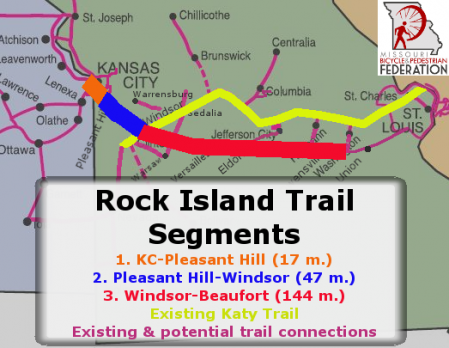 We will let you know if they make such an opportunity available, and are currently working with the Missouri Rock Island Trail, Inc., and other groups on possible ways for the public to weigh in on the decision. You can see the Missouri State Parks summary of the Rock Island corridor issue, including maps, an FAQ, and announcements of the upcoming meetings on the Missouri State Parks Rock Island Corridor Page. 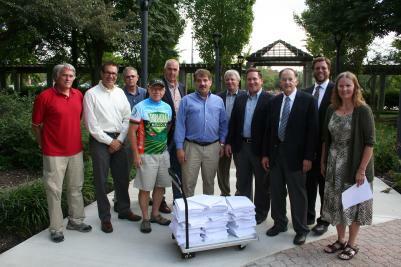 More about the history and background of the decades-long effort to preserve Missouri's Rock Island corridor as a cross-state trail on MoBikeFed's Rock Island Trail page.